Are you planning to buy a bike repair stand? You probably realise the it’s not wise to keep visiting your local bike shops for the smallest of bike servicing. In fact, most of the bike maintenance tasks can be performed at home, if you have the right tools. The bike stand is no exception. In fact, it’s among the first and most important bike tools to invest in. Keep in mind that not all repair stands are the same. They each differ in design quality and have their own pros and cons. Having said that, I’ve put together my top picks and I’m sure you’ll find one that suits your needs; whether you’re on a budget, home mechanic or an aspiring pro mechanic. You don’t have to spend a fortune on a bike repair stand, you can spend a relatively modest amount and still get a good quality stand with the features you need. 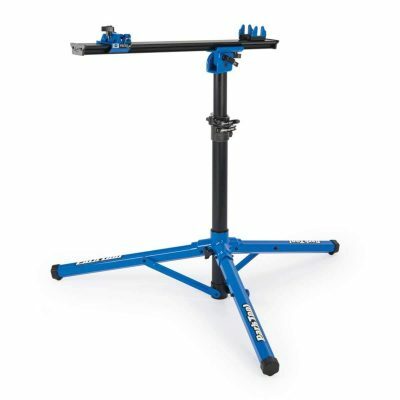 The Bikehand Pro Mechanic Stand is my top choice for a value for money bike repair stand. It’s constructed of robust aluminum and is both height and angle adjustable. The clamp rotates to suit most frame types and will grip strongly enough for heavier bikes without damaging the frame or paint. With a neat tool tray and the ability to fold away, this repair stand has everything you need to fettle, adjust, repair and upgrade your bike. The inclusion of quick release handles for the clamps and adjustments means setting this up and breaking it down is a breeze. The Safstar Pro Repair Stand is my second choice for best value bike repair stand after the Bikehand Pro Mechanic Stand. It’s another solid option that delivers a lot of stability and features without breaking the bank. This stand is constructed from a steel frame with plastic clamps and tool tray. It is rated for up to 30kg so can cope with mountain bikes as well as road bikes. With adjustable height, legs, clamp angle and strength, this is another flexible option for keeping your bike in good repair. The plastic is robust and the clamp more than strong enough for any road bike and most mountain bikes. It folds away nicely for efficient storage too. 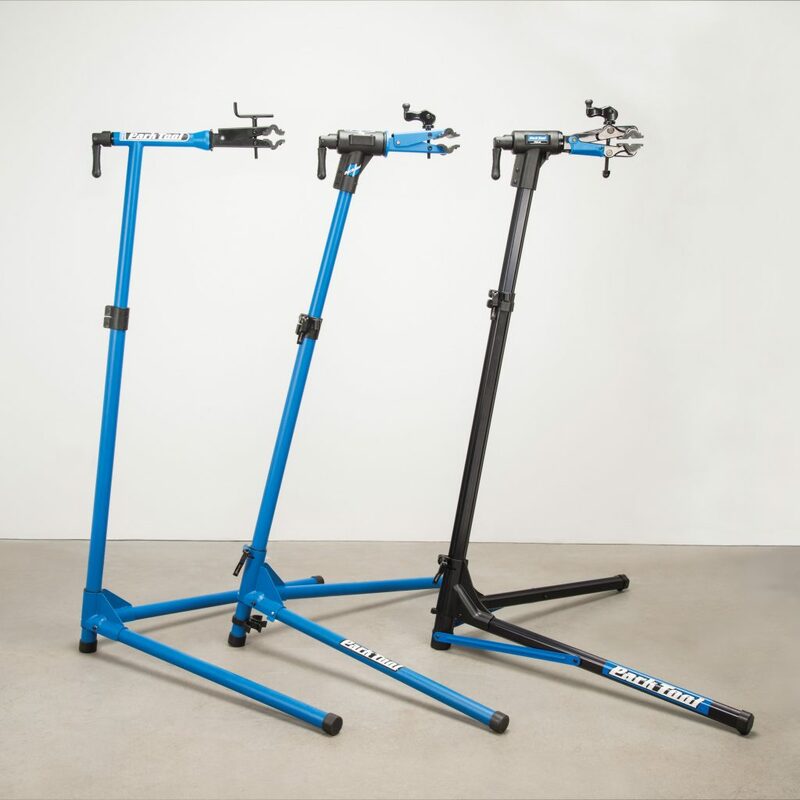 While most of these bike repair stands will fold down into a manageable size, for true portability, these two stands below are way ahead of their competitors. They offer all the benefits of the others in this list but make it easy to move them around. The Tacx Spider Team Work Stand is a quality piece of kit as you would expect. It has the standard repair stand appearance with a couple of extra clamps on the horizontal to hold forks. This offers a lot more scope for repairs or adjustments on both road and mountain bikes as well as setups with power meters or carbon cranks. The stand is made from aluminum and plastic, both of a very high quality. The clamps are quick release and will work with most frame and fork sizes. Its raison d’être is its dimensions, a mere 120 x 23 x 18cm when folded down. The Park Tool PRS-25 is my second choice for portability. It also demonstrates the quality of the brand with excellent design and construction and all the features a bike mechanic needs. 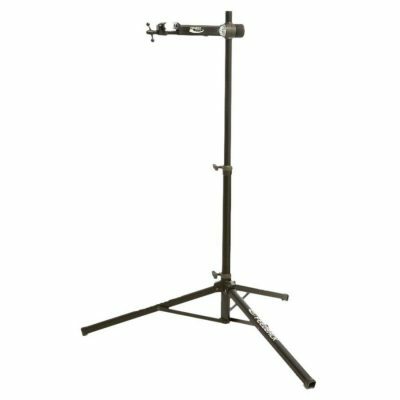 It’s a more traditional repair stand with a rotating clamp atop an adjustable vertical and pair of legs for stability. Constructed from hexagon aluminum tubes, the stand is rated for up to 45kg making it the strongest here. Despite its strength, it weighs only 6kg and measures just 120 x 23 x 23cm when folded down. The top clamp requires some force to hold bikes at an angle but the material is more than up to the job. If you’re a little more serious about bike maintenance, then a little more investment will get you a better quality stand with some neat features. The Topeak Prepstand ZX continues the brand’s habit of delivering top quality kit with great design and useful features. This stand is no different. Topeak has designed this stand with the same 6061 aluminum that many bike frames are made of. With rubber feet and a gentle quick release clamp, this stand is simple done well. There is an optional tool tray too. The clamp angles to support either a seat post or seat tube and gently holds it in place. This ensures absolutely no damage to your paintwork while holding it in place. While it looks deceptively simple, this stand delivers on every count. The Feedback Sports Sport Mechanic is my second choice bike stand for the home mechanic. 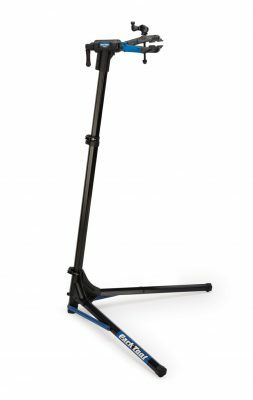 It’s another quality stand constructed of 6061 aluminum with adjustable height, rubber tipped feet and clamp and quick release fittings. The stand is light and folds up small making for easy storage or transport. The highlight of this stand is its ability to be stable on many surface types. This would be ideal if preparing your bike for a sportive or event. As it is rated for up to 29.5kg, it can handle mountain bikes too. With a strong but gentle grip and ability to infinitely adjust, this is also a solid option for home mechanics. 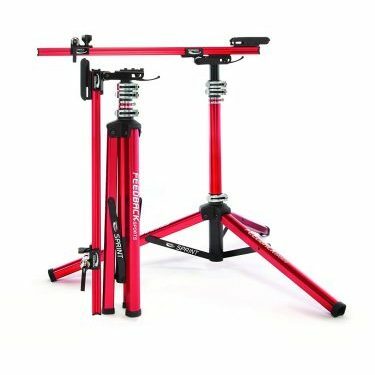 If you want to make your living as a bike mechanic or want the same quality and features as a pro mechanic, these two bike repair stands deliver. Both are top quality options for those for whom budget isn’t an issue. The Park Tool Team Issue PRS 22.2 is my top choice for pro-level repairs. Originally designed for pro tour mechanics, it is now available to us mere mortals. It’s a solid and very stable tripod design with frame supports for forks or bottom bracket rather than adjustable clamp. This offers much more stability and less chance of damaging your frame or paintwork. This stand is manufactured using 6063 aluminum with composite accessories. The adjustable clamps will work with all frame types and fork sizes. With a maximum weight of 27kg, it can handle most bike types too. 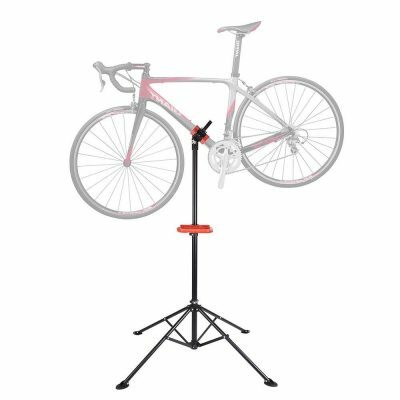 The Feedback Sports Sprint Stand is another pro level repair stand which quickly becomes obvious as soon as you unbox it. In a rich anodized red color, it certainly stands out. The design is similar to the Park Tool PRS22.2 with a tripod, extendable height and fork or bottom bracket clamps. 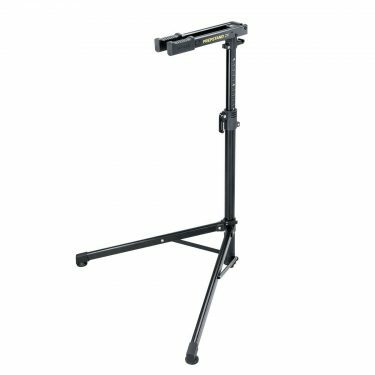 Also like the Park Tool PRS22.2, this stand should be stable on most surfaces making it ideal for taking with you. Constructed from 6061 aluminum with rubber coated plastic accessories, this is built to last and comes with a carry bag to keep it looking like new. Capable of handling any bike up to 39kg, you could repair almost any bike using this. If portability or being able to fold it away isn’t your top priority, nothing beats the stability of a wall mounted repair stand. It doesn’t have the adjustability of a mobile stand but it can usually cope with much heavier bikes. 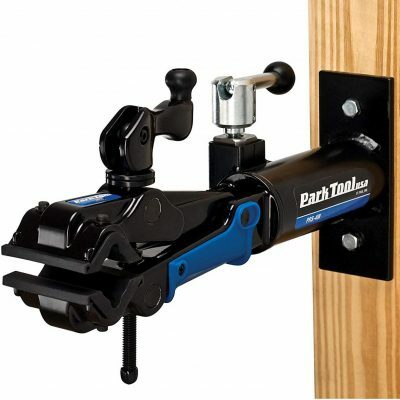 The Park Tool PRS 4W is my top choice for a wall mounted stand. It’s a great design with solid construction and offers similar adjustability to other stands with the advantage of being fixed to the wall. It stands 37cm from the wall offering lots of room to adjust your bike without becoming inconvenient. The construction is solid cast aluminum with a tough plastic cover. It is weatherproof and adjustable for frames up to 41mm. What you would think as an incredibly simple device has been thoroughly designed and thought through offering the best stand of its kind in our opinion. 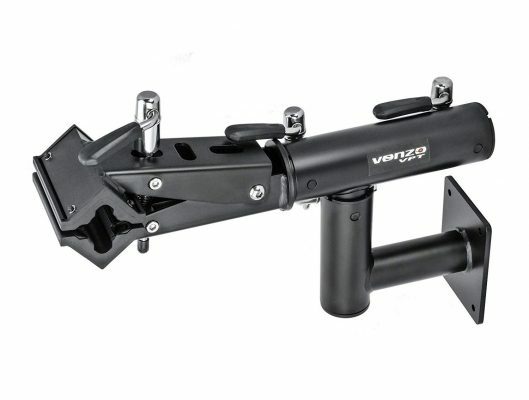 The Venzo Bike Wall Mount is my second choice for best wall mounted repair stand. It’s a more subtle design than the Park Tool PRS 4W but no less capable. In pure black with anodized fittings, it looks cool and has a clean design. 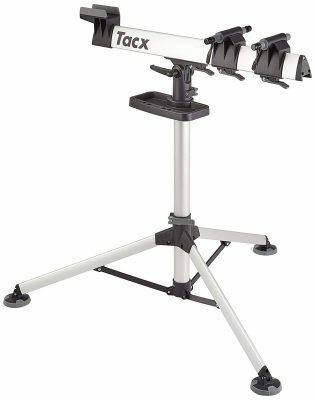 Constructed of powder coated steel with anodized quick release levers and rubber coated accessories, this has been well built and offers a sturdy stand. The clamp rotates 360 degrees and stands 55cm from the wall allowing for lots of room to move while working on your bike. With a strong grip and adjustable angles, plus that high strength steel, you should be able to work on any bike using this. You’ll probably seen by now that there are various types of repair stands out there. Each of them differ and have their own pros and cons. Before you head out and buy one, here are some of the things you should keep in mind and look out for. Hopefully, they’ll help you make an informed purchase decision. Stability is an important attribute to consider in a bike repair stand, and it often varies based on the design of different models. The more stable a stand is, the safer it is because it is less likely to topple over and injure someone or damage your bike. V Shape. The legs are spread in a V shape. They’re usually found in portable bike stands such as the Park Tool PRS 25. Tripod Shape. The tripod shape design means that a stand has three supporting legs. It’s a very stable stand as the 3 legs are spread wide apart. A good example is the Park Tool PRS 22.2 and the Feedback Sports Sprint Stand. Pay particular attention to repair stands that use a clamp to hold your bikes like the Park Tool PRS-25. They usually have a weight limit of what it can support. Usually it can be anywhere between 20 to 40kg. If you’re working on a road bike, there’s not much for you to worry about. But if you’re working on heavier bikes such as mountain bike, commuter bike, fat bike or a e-bike, then you’ve to pay more attention. If you like carrying your repair stand on-the-go or do not have a permanent workspace in your home, then you need to consider the portability of your stand. When considering portability, I recommend going for a lightweight stand such as the Tacx Team Spider. Besides, you could also shop around for a stand that collapses or one that could be folded to a smaller size for travel or storage. You’ll also need to ensure that your stand is easy to set up when the need arises. The last thing you want is to perform your bike repairs or routine maintenance in absolute discomfort and end up with a stiff neck or aching back. 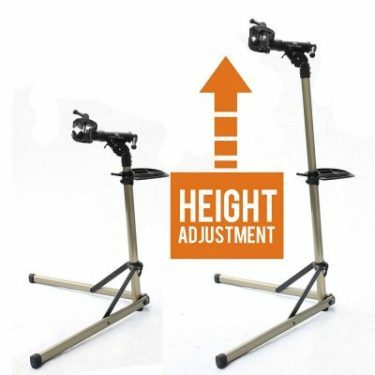 While almost all repair stand options will offer height adjustment, I recommend you consider your height as well as that of your bike. If you are tall, look for a stand that elevates your bike to a position you can easily and comfortably work on all parts. Comfort can determine how quickly and effectively you accomplish the repair work, so you don’t want to bend over every time you need to work on the bike. If you’re considering a bike stand with a top tube or seatpost clamping style such as the Topeak Prepstand ZX, give serious consideration about the clamp design. When I mention clamp design, I mean the manner in which your bike is held onto the work stand. In most cases, this will determine whether your work will be easy or not. Besides being easy to retrieve, the clamp style should also have a rubberized grip to avoid any damage on your bike’s finish. It’s even more important if it’s a carbon bike frame. Similar to buying a bike, your repair stand is also an investment, so you need to get the best out of it. You want to buy a bike work stand that will withstand all the rough handling, falls, and the weight of your bike. In this case, you should go for a stand that has a robust construction and that uses quality materials such as the Feedback Sports Sprint Stand or the Park Tool PRS 22.2. While they might cost more than the rest, they last you for a long time and save you a lot of hassle. The durability of your bike stand determines how long this piece of equipment will serve you, so you do not want to settle for anything mediocre. While plastic material might look aesthetically appealing, it’s not a material I would recommend for your bike stand if your focus is longevity. When performing complex repairs, like bleeding hydraulic brakes, the ability to maneuver between angles is vital. To achieve this, you need a stand that is adjustable, easily swivels and locks down onto the angle. You do not want to start working on something precise, and your bike tilts away.